Springs can be incorporated into virtually every type of check valve to ensure the continued integrity of the mechanism. Rather than a particular category, the word spring is more often incorporated in the name of these other non return valve types. A ball check valve, for example, that uses a spring would be referred to as a spring loaded ball check valve. Swing check valves, wafer check valves and lift check valves also commonly employ a spring mechanism. The spring check valve is designed to regulate the directionality of a given process stream in a number of industrial applications. Sewage, water treatment, food and chemical processing, petrochemical and power generation industries and many others use these simple devices to increase the pressure rating or cracking pressure, which is the minimum pressure required to force the valve open. Springs also provide a stronger resistance to backflow, the prevention of which is the main goal of a check valve. Domestic and commercial check valves may also employ spring loading, though smaller coils are often used. It is important to consider the spring and valve specifications to ensure that the spring is strong enough to prevent excessive valve opening, but does not prevent the valve from opening at operational flow pressures. There are five main components used in the configuration of spring check valves, though specific models may vary considerably. The body is the unit that is inserted in the pipeline or cistern that houses the valve mechanism. Located in the cross section of this cylindrical or spherical cavity is a gap or hole known as the seat. A ball, disc, or other plugging device is held steadily against the seat by the spring. 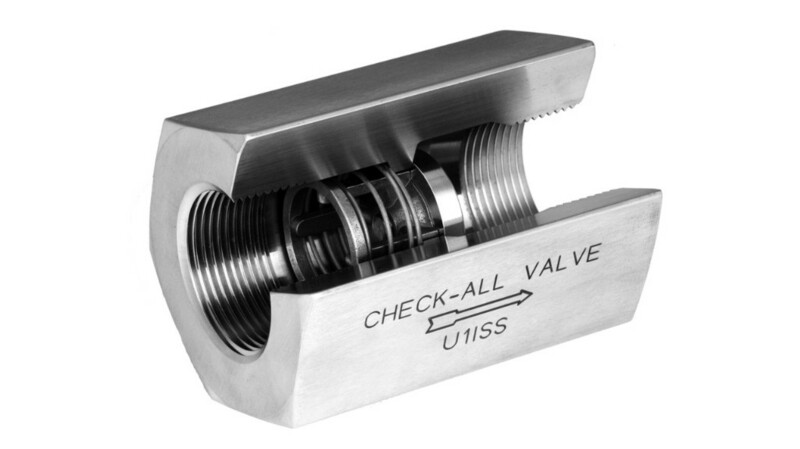 Both the spring and the stopper are located on the downstream side of the check valve. When a process stream of air or fluid generates enough downstream force to counter the force exerted by the spring, it compresses into a spring retainer. This allows the plug to lift from the seat, creating a gap through which the materials may flow. When the pressure drops, the spring quickly pushes the ball or disc-like implement back to the seat, forming a tight seal. Spring loaded devices can be mounted both horizontally and vertically regardless of flow direction since they rely on the decompression of the spring itself to close the valve rather than pressure from backflow or gravity as is the case in non spring valve configurations. Valve components are commonly made of durable metals such as steel, aluminum, iron and brass as well as plastics like PVC and polyethylene, depending upon the chemical composition of the process stream. The springs themselves are made of metal wire that is wound around a cylinder or core and specially formulated for added elasticity. The elasticity of a spring enables it to return to its original position; however, this capability diminishes with use, which should be carefully considered when installing a spring check valve. Spring Check Valves Spring check valves implement coiled metal components in order to increase the amount of pressure needed to open the valve as well as help maintain closure even in the presence of strong reverse flow surges.